Rarities from the Robert Bierman collection, with the famed 1946 Warner Brothers cartoon "Book Revue" -- where Goodman, Harry James, Sinatra and Gene Krupa are immortalized in animation--as the centerpiece. Also included: Incisive clips from the ultra-rare, 1963 television documentary, "World of Benny Goodman, " where Dave Brubeck, Teddy Wilson, John Hammond, Krupa and others talk about BG. Then there are 1974 interviews with Louis Bellson and Lionel Hampton, conducted just before rehearsal for the 1974 Felt Forum Tribute to Gene Krupa concert. Wait, there's more. 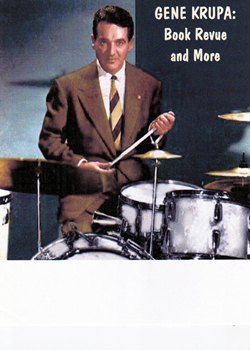 Trailers from "Girl Crazy," "The Gang's All Here," "Ball of Fire," "The Gene Krupa Story" (best quality we've seen), clips of Charlie Barnet, Goodman and the Krupa/Cozy Cole sequence from "The Glenn Miller Story." What a find!